Share the post "Rutgers NJAES Cooperative Extension of Sussex County Celebrates 100th Anniversary"
Reprinted from the New Jersey Herald with permission from the author. The County’s agriculture community faced a critical situation. Farms were being sold out with the men going to work in the mines, factories or heading west. The problem was compounded with the coming of the railroads forcing farmers to compete with western farmers and what appeared to be discriminatory rail freight rates. It was under this set of circumstances that a group of determined men met on New Year’s Day 1912 in an attempt to bring a solution to the problems faced by the farmers. In attendance at that historic session were representatives from the DL&WRR, the Newton Board of Trade, County Freeholders as well as members of the agriculture community. Among those present were George Van Horn, Sr. and the Roy’s of Fredon, Robert Armstrong, Sr. and Theodore Roe of Frankford, Wilfred Hibler of Green, the DeKays and Drews of Vernon and W.W. Titsworth and Louis Harden of Wantage. As a result of that meeting the Sussex County Extension Service was organized and became effective on March 12, 1912 with the DL&WRR agreeing to pay half of the costs toward the hiring of a county extension agent. Van Horn is viewed as the father of the Extension Service in Sussex County as he organized the meeting that quickly led to the establishment of the Cooperative Extension Service of Sussex County. Van Horn, a fruit farmer had attended a short agriculture course at Rutgers. He quickly recognized the value of scientific knowledge and practical experience that could be gained from the Agriculture Experiment Station. 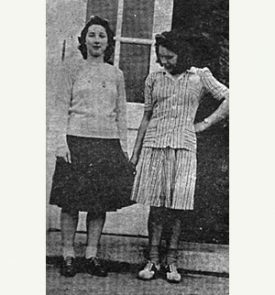 A 4-Her admires her friend’s handiwork on a skirt made from 4-H donated cloth, circa 1950. Events moved forward rather quickly as on March 16, 1912 Henry W. Gilbertson was hired as the county and the state’s first agriculture agent. Presumably Gilbertson had his work cut out for him. It’s still uncertain where the Extension Service’ first office was located but here in his office Gilbertson took a county map on which he located the county’s farms. During his first year of employment Gilbertson visited 700 farms and travelled 6,000 miles. What makes that feat so remarkable is that despite his wish for one, Gilbertson did not have a car, and travelled around the county on horseback. In addition to visiting the farms, reminiscent of the old-time circuit riding preachers, Gilbertson held classes and demonstrations in homes, churches, grange halls and at large outdoor meetings held at various farms. Presumably, a “glutton for punishment” another project undertaken by Gilbertson was visiting the local schools. Based on the premise that the best way to reach farmers and home makers with new and better methods of doing things was through the children he contacted County Superintendent of Schools Ralph Decker. Encouraged and assisted by Decker Gilbertson then visited 40 schools to speak with the children. Confident that enough students would be interested the Gilbertsons embarked upon forming 4-H Clubs. Male members were primarily involved in planting corn seed while the girls’ initial project was a canning and gardening club. Mrs. Maud Gilbertson served as the leader and while she received no salary she did receive an annual $1 stipend to cover the costs of postage for mailing out literature to the 4-H members. 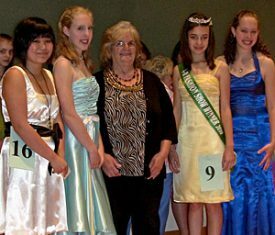 Sussex County 4-Hers continue the sewing tradition at the 4-H Fashion Show. Extension Specialist in Financial Resource Management Barbara O’Neill advises that the Extension Service received a tremendous boost in 1914 with the adoption of the Smith-Lever Act. The Smith-Lever Act established the Cooperative Extension as a partnership between the U. S. Dept. of Agriculture and the land-grant universities. The local agents served as a link between the colleges who were conducting the research and the farmers that could use the information to improve their farming skills. This Act also required states to match Federal funding on an equal basis. On October 10, 1913 the Sussex Register reported that the Newton Board of Trades held a special meeting to hear a report from the committee who was assisting Gilbertson in preparing for the Farmers’ Day. Subsequently, on Oct. 22 the Register reported that the Farmers’ Day which was held at the Court House was viewed as a success. Twenty-one boys and 30 girls participated with an estimated attendance of 1500 persons and the event reportedly resembling a country fair. Lucy Bale, who canned over 1,000 tomatoes, was the winner and she was awarded a free trip to Washington, D. C.
The Gilbertsons only remained in Sussex County until Jan. 1, 1915. But the seed that they planted continues to grow. The first Home Demonstration Agent, now called an Extension Home Economist, in Sussex County was Mabel Tallant. She was hired for only six weeks in 1917 to teach food preservation and community canning. In 1920 the first full time Home Economist Marjory Eeels was hired and served for three years. O’Neill advises that back then woman were expected to retire when they married and later when they became mothers. It was not until the late 1960s that married women or women with families were allowed to be employed, she says. According to O’Neill during the 1920s one of the popular classes was “millinery-making”. During this period an estimated 1,000 men’s and women’s hats were made by local homemakers. Another popular course over the years was the chair canning. Other classes conducted in addition to canning and hat making were making dress forms and patterns, “fireless cooker bees” and the preparation of cheaper cuts of meat. On Oct. 6, 1955 the New Jersey Herald reported that The Sussex County Farmhouse at 14-16 Church St. Newton would be officially dedicated on Fri., Oct. 14. The three-story brick building at the corner of Church St. and Linwood annex was acquired by the county and remodeled into an office to house all of the agricultural services and activities in the county. In recognition of this event the Herald issued a special supplement as a “Salute to Sussex County Agriculture”. O’Neill, who served as an Extension Home Economist in Sussex County from 1978-2004, advises that the Extension Service remained in that building until a 1969 fire. When she started working for the RCE of S.C. it was housed at St. Paul’s Abbey. Following that the office was housed at Don Bosco until SCCC took over the campus, then it was housed in the S. C. Court House, then in an old house in Frankford Township and presently the office is housed on the third floor of the old Alms House at 129 Morris Turnpike, adjacent to the county library. In looking back over the years O’Neill surmises that for her “it has been all the changes in the way that RCE and its employees provide research-based information. I started working in the RCE of S.C. office in 1978 in the BC (before computer) era. We used mimeograph machines for our publications and typed people’s addresses on cards that were always getting jammed. Flash forward 34 years and I’m answering questions via email, posting PowerPoint presentations in SlideShare, creating Web pages, and tweeting daily personal finance face-to-face classes as well, such as one last night for farm woman, but we used Eluminate to transmit it to classes at two additional sites”. She observes that “Technology allows us to work smarter, not harder”. O’Neill continues that “I think that three ‘constants’ during my three decades of Extension employment have been 1) a dedication to providing useful and unbiased information to state residents, 2) the ability to be creative in the development of educational outreach methods, and 3) the column in the New Jersey Sunday Herald which I started writing in 1978 and now write every three weeks, alternating with Steve Komar, agricultural agent and David Foord, 4-H Agent. Komar, who heads the Sussex County Extension Office, advises that his office provides research-based information to help county residents acquire knowledge to make informed, decisions to enable them to maintain or improve their quality of life. Educational programs are offered in 4-H Youth Development, Agriculture and Resource Management, Family and Community Health Sciences and Lawn and Garden. It’s one century ago since the County Extension Service was implemented in Sussex County. The agents no longer have to travel over dirt and dusty roads on horse back to visit farmers scattered throughout the county to provide them with information to enable them to make informed decisions. But as O’Neill explains “technology allows us to work smarter, not harder”.